Last summer--our first here at Mountain Meadow--I had to come up with something to deter ticks, plus keep flying biting insects at bay, but I absolutely hate the smell, feel, and taste of commercial bug sprays. I especially didn't want to douse my kiddos' tender skin in chemicals. So I reached out to my midwife, who is a quintessential off-grid, Natural Mountain Mama, and she passed on her recipe for natural insect repellant! 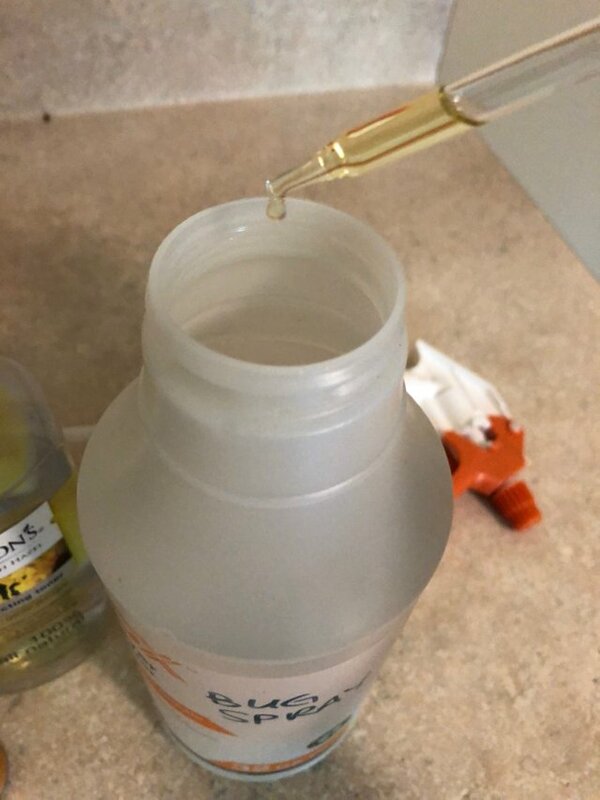 Combine all ingredients in a clean spray bottle! Shake well before each use. You can definitely play around with the oils....my midwife said she sometimes throws in pennyroyal, catnip, or lemon, and I myself have substituted some tea tree oil when I ran short on geranium. 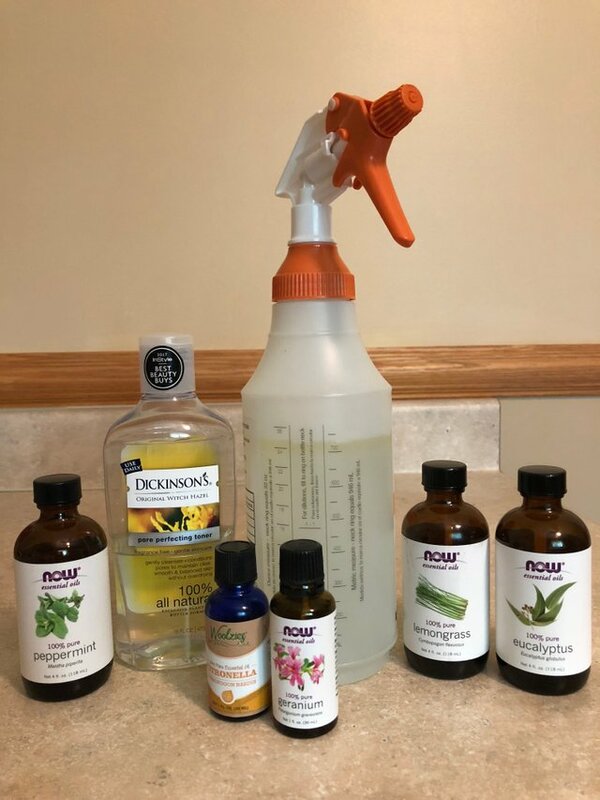 I must copy this recipe - we have serious bug and mosquito issues here in summer and midges that leave the most awful bites, in winter. Thanks for sharing. It's not an all-day formula like OFF, I'll admit! I couldn't say how long it lasts exactly, but I've been fine in hour or two stretches--when it's hot I don't stay outside for really long, and I just automatically reapply it whenever I go back out. Thanks for making this post - I too hate shop bought sprays and as I have eczema I couldn't use them even if I wanted to. I will definitely make your spray to keep the nasty bugs away - the bugs have returned with a vengance it seems, I am being bitten all over! Yeah, this is a human and not pet spray! I know, but some people do spray their pets trying to be helpful. Oh nice! Thanks for sharing the recipe. I'm going to have to see if I can get my parents to bring these oils in a few weeks when they come to visit. We have flies galore and some mosquitoes inside. This might help with that problem!! Thank you! You might not need all 70 drops if you're completely swapping tea tree for geranium since it's pretty strong. I just augmented with it when I ran short on geranium (which is mainly in there for ticks). Thanks for the recipe! If you're swapping out EOs, which repels which bugs, do you know specifically? Peppermint also repels spiders! I use that too. A word of caution to pet guardians though: EOs can be toxic to them, so I wouldn't use this on your cat for sure; I'm not sure about dogs. I've read advice not to use tea tree on dogs for sure because they might lick it off and ingest it. I love essential oil recipes! I have one for us and for my fur babies. What do you use for your fur babies? Asking as I have a dog and cat! I love this Idea. I haven't done much with essential oils, but I want to. This may be how I start. Thank you for sharing this. You're welcome! I haven't done a whole lot with oils either, other than scenting dryer balls :) This is the first real recipe I tried! WHAT a great recipe to have on hand right now, especially with so many people heading outdoors this weekend. I have all the ingredients except the geranium oil... is there an equivalent oil I can use? Nice! THanks! I have all of these and this looks like a great combo. Last year I bought a bunch of stuff to make a tick repellent and it didn’t really work. Now I just carry tape around. It’s nice to deter the other buggies though too! oh haha! we just found that it's easier to sensitive ourselves (or try to anyway!) to when they get on us. we carry tape around and just pluck them up with it, then the tape traps them. especially in "seed tick" season time, tape is essential around here. Great information!!! Upvoted and reblogged! !